I recently travelled up to Scotland to attend a Bat Handling Course run by Echoes Ecology in Polmont. The course was an opportunity to refresh and practise my bat handling skills as well as gain more experience in the techniques used to capture bats. The course involved two nights of trapping. On the first night we used a hand net to catch soprano pipistrelle bats at a roost near to Loch Lomond. The small size of this species requires care and delicacy when handling to ensure that their wellbeing. The second day was spent in the Echoes Offices with presentations on handling technique, bat identification, health and safety considerations and licensing. The atmosphere was relaxed and informal as well as informative, with discussion between candidates and course leaders. On the second night, we went to a viaduct site to capture Daubenton’s bats leaving a roost in the side of the viaduct wall. We also set up a mist net and captured a soprano pipistrelle foraging beside the canal. I have put together a short video of the harp trapping at the viaduct, including some trailcam footage of bats exiting the roost and encountering the harp trap. This was using the ‘Field Scan’ setting on the Bushnell Trailcam as bats do not seem to trigger the unit in my experience. I hope you enjoy the video below – if you would like further information on the courses run by Echoes Ecology, which include ornithological courses as well as bat courses, visit their website or their facebook page for more information. 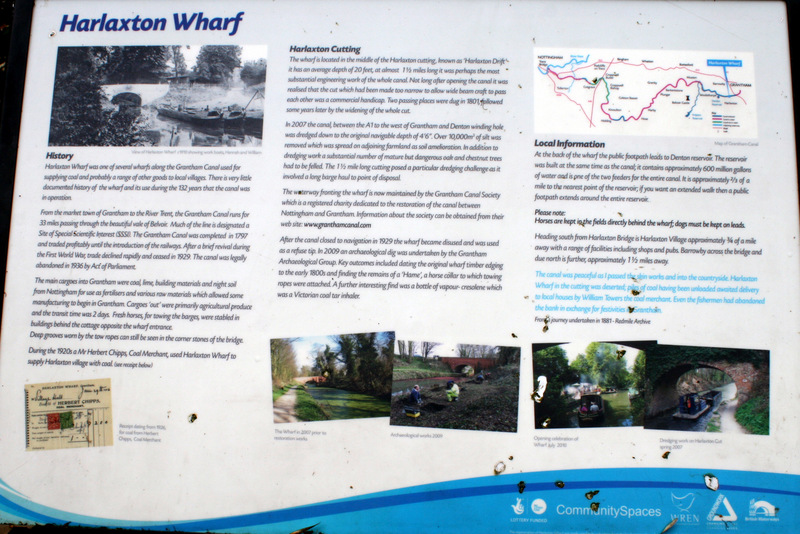 I stopped off at Harlaxton Wharf on a cycle along the canal and got somewhat waylaid identifying the flowers there – for a very small square of land, you will find many species of wildflower! These include many species planted intentionally, using Naturescape seeds and the assistance of the Princes Trust when the Wharf was restored. Others, including some of the more understated species but also some of the most impressive, are centuries-old inhabitants of the Grantham Canal bankside. I have run through a whirlwind description to help you identify the species which are there – I may have missed some so please let me know if you spot anything else whilst waiting for a Canal Boat ride from the Grantham Canal Society – more info about the trips which leave from the Wharf can be found here and details of the renovation works are here. There is also a gallery of photographs of the wildflowers, arranged by colour, to help you with identification. If you are visiting before July then the big flashy purple flowers from tall grey/green plumes of vegetation are corncockle (Agrostemma githago). Large herbaceous plants with purple flowers after this stage are the more likely to be the later flowering rosebay willowherb (Epilobium angustifolium), the plants of which can grow to 2m tall with their purple flowered trumpets topping a tower of lanceolate leaves. If the last description sounds right, bar the size, then the more diminutive broad-leaved willowherb (Epilobium montanum) might be your species – this grows no more than 50cm in height and is altogether more delicate than the big bruiser which is rosebay. The fluted flowers often shade from white to pink as they mature. Greater knapweed (Centaurea scabiosa) is also growing here – the flowers are almost thistle-like but are plumed with tendrils at the petal tips. The colour is blue with a tinge of purple and the leaves are unlike thistles completely – robust fleshy and smooth green leaves with none of the spikes associated with thistles. The large familiar yellow flowers growing from a rosette of toothed leaves (dandelion coming from the French: Dents de Lion) are your common or garden dandelion (Taraxacum officinale agg.). Watch out too for smaller, finer flowered versions – these are autumn hawkbit (Leontodon autumnalis) and they are not in flower until later in the year, as the name suggests. Common nettle (Urtica dioica) should be known to most – if it stings you then you have your identification. The flowers on this are non-descript to say the least, fine tassles of tiny flowers in a sting-bead. If your ‘nettle’ has flowers then check the colour. There are a number of non-stinging ‘dead’ nettles and two of these are found at the Wharf. Luckily, their colour gives them away – white dead-nettle (Lamium album) is white whilst red dead nettle (Lamium purpureum) is red. There are other differences to tell the apart – the key characteristic is size and stature – if your deadnettle is approaching the structure of a stinging nettle then it is most probably white. Red is much less sturdy, often lower to the ground with finer leaves. There is a third option for a species with nettle-like leaves but no sting and this is hedge woundwort (Stachys sylvatica) – this has spikes of purple flowers which look almost orchid like. The best test here is scent- if there is a powerful unpleasant scent from the crushed leaf (certainly not like anything else I have ever smelt) then this is your species! Taller flowers of red or white on long flower stalks with soft ovoid leaves are the red campion (Silene dioica) and the white campion (Silene latifolia). Again, there are other campions to choose from – the bladder campion can be seen out in the limestone swards of The Drift or the Viking Way – but only these two species are on the Wharf. Colour is key to ID! Rounded, softly serrated leaves and a noticeably squared stem identify common figwort (Scrophularia nodosa). The flowers are deep red but tiny – at first glance you might think them buds waiting to burst into an exciting rich flower but closer inspection reveals them to be at the height of their glory. Buttercups come in different shapes and sizes and two can be found here beside the canal – creeping buttercup (Ranunculus repens) is a very common species which is often found in damper places – a wet flush in a pasture field will often be stained yellow with the flowers. Other species are also common and a second can be found here – bulbous buttercup (Ranunculus bulbosus) differs in the leaf and structure but the key ID is in the flowers – the sepals (these are the green beneath the flower) are reflexed, that is they are peeled back like a banana and pressed against the stem below. Earlier in the year, you will see buttercup-like flowers but these could well be lesser celandine (Ranunculus ficaria). The flower petals of this species are more pointed than the very rounded petals of the buttercups and the leaves are round and shiny rather than serrated and dissected like those of the buttercups. For similarity of name rather than similarity of plant, I will also mention the greater celandine (Chelidonium majus). This is no relation to the lesser celandine but shares a name nonetheless. Greater celandine is in the cabbage family and is a much larger, more foliose plant. You get a lot of leaf for your flower! Spiky plants next: there are three purple-flowered thistle species to be seen. The biggest, boldest thistle with spikes which look as though they have the ability to impale are the spear thistle (Cirsium vulgare) – think of the spikes as spears for an easy way to remember. There are too smaller species which look as though they could just give you a nasty prickling – here the key difference to tell them apart is the presence of spiky leaflets on the main stems – welted thistle (Carduus crispus) has them whilst creeping thistle (Cirsium arvensis) does not. To confuse matters ever so slightly further, there is another similar species you will see which is in fact a sowthistle rather than a thistle – the thistles all have purple flowers whereas the sow thistle has yellow flowers. The prickly sow thistle (Sonchus asper) has spikey leaves which wrap around their stem. A smooth version of this called, appropriately enough, a smooth sow thistle (Sonchus oleraceus) grows alongside it. Of very different structure, but on the theme of spikes, are the white-flowered bramble (Rubus fruticosus agg.) which rambles along the ground and up through adjacent shrubs and trees. It should be familiar to anybody who has been blackberry-ing. Also instantly recognisable is the rose which grows wild here – the curved thorns and open white-pink flowers should be immediately recognisable to genus. This species is the dog rose (Rosa canina). The tall, white-flowered umbellifers are another distinctive group – their flowers are in umbels which can be thought of as umbrellas for an easy visual clue. The leaves vary but are generally divided to a greater or lesser extent – lots of ‘empty space’ within the leaf footprint if you will. If the leaves are big and bold, divided into big lobes then you have hogweed (Heracleum sphondylium). Then there is the notorious ground elder (Aegopodium podagraria) – if you have it in your garden then you can pick it out of a line-up. The leaves appear directly from the ground very much like the leaves of the elder after which it is named. This will also send up dense heads of white flowers in a compact cluster. If it is neither of these, then next check is the stem – if there are purple dots of blotches then you have the highly toxic hemlock (Conium maculatum) – back away slowly and for goodness sake do not touch or eat. This leaves two other umbellifers which flower at the wharf and the simplest way to differentiate is to ask what time of year it is. Cow parsley (Anthriscus sylvestris) is a big, brash species which flowers early in the spring and is generally going over by the end of May. This is superseded by the smaller, finer, more delicate hedge parsley (Torilis japonica) which flowers for the remainder of the summer. Two primrose species are to be found – a line of wild primrose (Primula vulgaris) grow along the bank with their pale yellow, individual flowers which are open and relatively large with wavy, indefinite edges. By contrast the cowslip (Primula veris) has groups of tighter, more enclosed flowers which hang together – a brighter yellow in colour with flecks of orange. Ivy (Hedera helix) should need no introduction – a creeping plant with glossy green heart-shaped leaves. The flowers in the autumn are a great nectar source – clusters of small black sphered which look something like a tiny bunch of black grapes. Some of the largest leaves on the Wharf belong to burdock (Arctium lappa) – these are greyish green above and whitish green below. The burdock flowers are fairly insipid but the seeds are a ball of hooks which fall apart to individual hooked seeds when you try to pick them apart when snagged on hair or clothes. Another species which will stick to you if it has a chance is cleavers (Galium aparine). This has tiny four-petalled white flowers and grows in long strands, often creeping and climbing its way through other vegetation, with little whorls of leaves intermittently up its stem. There are a number of galium species in the UK but this is the most common and the only one which will stick to your jumper with ease! There are a number of small plants with purple flowers and a more or less creeping characteristic – I will tell you about each in turn. Plants with little deep-purple trumpet-shaped flowers and ivy-shaped leaves – these will be the ground ivy (Glechoma hederacea). If the leaf description sounds right but the flowers do not, then perhaps the delicate trailing ivy-leaved toadflax (Cymbalaria muralis) is your species – these flowers have three lower petals and two upper with a yellow patch in the centre. If the purple flowers are star-shaped with fine green filigree foliage and red-wine stems then it is probably herb Robert (Geranium robertianum). Finally, if the plant has a more upright character with purple pea-like flowers and tendrils on the ends of the pinnate leaf stems, then this will be the common vetch (Vicia sativa). A species which stands apart from the others is Lords and Ladies or Arum lily (Arum maculatum). The deep-green, often dark-flecked waxy leaves emerge straight from the ground in the early spring with the pale hooded flower rearing up soon afterwards with the long purple flower spike below. The action is all over by mid-May with the green berries appearing on a low spike, turning to red in the autumn. Small yellow flowers on a substantial plant could be wood avens (Geum urbanum) – these leave a strange seed something like a strawberry after the flower has been fertilised and the flower lost. Nipplewort (Lapsana communis) is a taller species with a number of yellow flowers present in a very diffuse ‘head’. The flowers on the former have five distinct petals whilst the latter is a composite flower – it is a member of the daisy family – and has a larger number of yellow florets which somewhat crowd into one. If your plant is much lower to the ground, with red-flecked yellow pea-like flowers and clover-like leaves, then it will be bird’s foot trefoil (Lotus corniculatus). A final yellow-flowered possibility is the low, fleshy groundsel (Senecio vulgaris) whose flowers look perpetually as though they are just about to emerge – a bud waiting to burst. It never will – the flower rivals figwort for the disappointment following from bud to flower. Clover-like flowers and clover-like (three-leafed) leaves growing close to the ground or sometimes bubbling and swelling into a mound is the white clover (Trifolium repens). This is a creeping plant and will rarely be found with individual flowers and leaves. A discreet, compact little plant with a flower spike of tiny white flowers to only 10cm high and leaves like lines of diminishing green coins laid out along the stem will be wavy bitter-cress (Cardamine flexuosa). A creeping, clambering plant with as much green sepal as white petal on the flower will be common chickweed (Stellaria media). A much more upright plant will be garlic mustard (Alliaria petiolata) – rub the leaves and release the faint smell to confirm the ID but be warned that this does not confer the taste to food it is used in cooking, unlike wild garlic which is found up in Belvoir Woods and out east at Belton House amongst others. Multiple blue flowers with small, soft, green leaves like the ears of some small creature? Water forget-me-not (Myosotis scorpioides). And no, despite the name, this will be growing on the banks of the Wharf rather than in the canal itself. Two poppy species are flowering here; the opium poppy (Papaver somniferum) has flowers which are an insipid but delicate shade of purple with grey-green foliage. The more familiar common poppy (Papaver rhoeas) can also be seen – these are the archetypal poppy with the deep red leaves and the black centre. The old childhood adage said that where there are nettles to sting, there is dock to relieve. I never found this to be true but there are two species of dock to be seen. The big, bold, cumbersome species is broadleaf dock (Rumex obtusifolius). A smaller species with long, narrow pointed leaves and red veins is the wood dock (Rumex sanguineus). the leaves and a sniff should reveal the truth of the name. I have left until last the most effusive and the most unimpressive flowers – I will deal with the latter first. The fat hen (Chenopodium album) flower is a mealy, beady insipid-red affair which you would struggle to even notice. The leaves always remind me a little of dinosaur footprints – this is a plant which will generally pass everybody by although it does make good eating! By contrast, the ox-eye daisy (Leucanthemum vulgare) – like the garden variety but blown up to gigantic proportions with crinkle-cut leaves and a big yellow centre is fairly unmistakable. Juvenile blackbird practising nest building? I left a trailcam recording a blackbird nest after the chicks had fledged, hoping they might return to have a second brood. The parent blackbirds have subsequently set up a new nest elsewhere in the garden for a second brood but I have a few clips of this juvenile blackbird apparently practising repairing/building the abandoned nest it was born in – after these clips it wasn’t recorded at the nest again for the following week and no further use of the nest has occurred so far. I thought this was rather interesting behaviour – it reminded me of a child playing with a doll’s house as though it was practising for when it was grown up! Any thoughts or observations on this behaviour would be welcomed!